Since I currently have the guild's 8 shaft Baby Wolf here, I am dressing it with the warp for the Looking at Twills workshop next weekend. This warp is 2/20 mercerized cotton. It's been a while since I've worked with anything finer than 2/16 cotton, and I remember now why I've pretty much given up. It's not that I'm 'afraid' of it, nor that I'm 'worried' about working with such fine yarn. It's more that my body is complaining. My hands have lost some of their dexterity over the years and yarn this fine makes my thumbs hurt. (Yes, arthritis due to working with my hands for so many years has made an appearance, not to mention joint/muscle pain as an adverse effect of not one but two medications I'm taking.) And then there is my eyesight. I've been short sighted for nearly all of my life and that is something that just gets...worse...as the years go by. However, this warp is only about 8 inches wide, 36 epi. It won't take long to get it done. And even with my aging body, I'm still probably faster than any of the students in the class. So they will get the experience of weaving with this yarn and then they can decide if it is something they want to work with. For more information about colour and weaving, you might find Tien Chiu's on line class interesting. Also Jane Stafford's on line guild. This year will be all about colour and design. My life has been a roller coaster for more years than I care to think about. Being a self-employed weaver in the 20th and 21st centuries is...challenging. Then, for the past 10 years, add in serious, potentially life ending health issues (my allergies and whiplash injuries are not exactly life ending, just annoying), well, there has been plenty for me to muse on lately. See, being self-employed means a whole lot of things. Working to deadline. Bringing in and paying for materials long before you ever see the income from using them up from making fabric to sell. Accepting commissions and sometimes not delivering what the client wants. Or making a terminal error because you are rushing, don't stop to think, mess up. My new medication is helping to keep me alive, but at a cost. Fortunately the adverse effects aren't horrible, just annoying (see comment about allergies/whiplash above). But one of the things it does is make me feel tired. I don't have the fatigue brain fog any more - just this low grade feeling of never being able to get enough sleep to feel refreshed. As some people with chronic illness say - my supply of daily spoons is limited - and I run out long before I'm used to. I am going to exit my 7th decade in just over two years (I should have said 'exit', not 'enter' in a recent post). When I chose to weave I thought I would production weave and sell my textiles for the first 25 years, which would take me to 50, then teach for the next 25 years, which would take me to 75. Well, I'm damn close to that second number now. I am thinking I am well beyond 50 and yet, here I am, still weaving for production, schlepping boxes of textiles to craft fairs. People I know have been retired for over 10 years. And here I am, still working to deadline, juggling dates, commitments, scrambling to get things done. As my energy drains out of me at the end of the day (like now) 'retirement' - at least from the production aspect of weaving - seems more and more attractive. But I have this stash. So now, I'm thinking that if I concentrate and work with intent on getting my stash woven down, that 2020 seems like a good year to end doing out of town shows. This year I'm only doing one out of town, the other two are local. So I will probably carry on doing the local ones - if only to sell down my inventory and reduce that aspect of my stash, too. It is beginning to feel as though it is time to start winding up the selling textiles part of my career. I do still enjoy the teaching, but now I am focusing more and more on the Olds program. Today I finished the run of silk scarves I wove for the fall sales. I have some silk set aside for a project for The Intentional Weaver. I may get that into the loom next. Technically I only need about 7 projects to illustrate the weave structures I'm including, but knowing me I will want to do variations to show how to manipulate the weave structure to create different designs. There are also several people who have offered to design and weave projects for me. Realistically I probably will do, oh, 12? Myself? Given how fast I am, that isn't even a whole lot of work. I have made arrangements for my editor to come in July to deal with the photographs so I'm going to try really hard to get those 12 things woven over the next 3.5 months, in between marking homework and teaching classes. Which doesn't leave a whole lot of time for production. So I may be a wee bit thin on the inventory part of the craft fair shows. But I am going to try to use my spoons wisely and balance my energy so that I can get everything I want done accomplished. There are times in my life when I know I’m one of the very fortunate. This February I got to be with Laura in Prince George. In addition to spending time with two people who seem to enjoy me as much as I enjoy them I had the opportunity to learn a lot about myself and my weaving. Laura was at the end of a warp on the AVL and offered to let me weave 2 towels. I have little experience with linen and she had a couple bobbins in a humidor so I was set. The surprise for me weaving on the AVL was how much attention I could pay to just the mechanics. 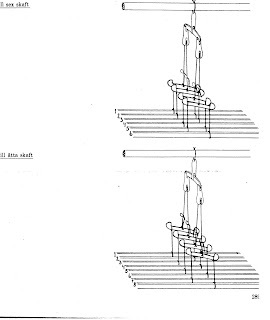 The computer keeps track of the “treadling” sequence; the automatic advance keeps track of the fell line. “All” I had to do was keep track of me. It turned out to be quite a job. Here are things I learned in the order my mind became aware of them. 8 * Wear Ear Protection. This is especially necessary when working with an air assist. That baby is LOUD. It is a lesson I’ve taken home. I have a Baby Mac and have been weaving with noise cancelling headphones on and really have noticed the difference when I take them off. · * Keep your feet flat on the floor. On the AVL one foot presses the pedal. One foot is, if you’re me, on its toes making my calf cramp. That habit took nearly 2 hours to break. My take home is to be aware where your feet are. I’ve found there is a good resting place for the foot not treadling at the moment. I can weave longer with more comfort if I am thoughtful of my feet. · *A pelvic tilt helps concentrate the power in your core when you pull the beater: That baby is heavy! It’s got all sorts of add-ons for a flying shuttle (If I recall correctly it can manage 4 colors at a time) and controls the cloth advance. Laura can throw the shuttle fast enough to just let the beater ricochet its way back and forth. I’m not so fast and needed to control it on the far side of the swing. It takes a whole lot of core strength to slow it down to my speed. Keep that tilt going! It has made a huge difference in my home weaving. I maintain good posture and can weave longer and feel better all around. · * Relax your shoulders. Good posture lets you weave longer. · * The weight of the bobbin changes the throw strength. I didn’t appreciate how much difference this makes over one bobbin. I had to change my technique as the bobbin emptied in order to have it cross the entire width of the warp and end up in my hand ready to toss back. This isn’t as noticeable with my smaller loom but really made an impression on me. · * Watch the angle in the shed, too much leaves loops. As I was using linen the thread itself wanted to sproing like a spring in the shed when the humidor hadn’t moistened the inner yarn on the bobbin. I would have way too much slack to lay flat. Keeping track of all the above things made watching for this fall by the wayside too many times. Selvedges suffered. · * A humidor is your best friend with linen. The yarn softens and turns the selvedges better. · * When Bobbins are dry in the center they are harder to control. Make sure they have plenty of time to humidify. · * Fixing broken threads is the same with 16 shafts as with 4. You can get good at it. It only looks intimidating. When you are getting too much experience look for a reason. · * A loud, breathing, puffing, clanking machine isn’t scary when you know what makes all those sounds. It’s possible to sort out what is happening where. 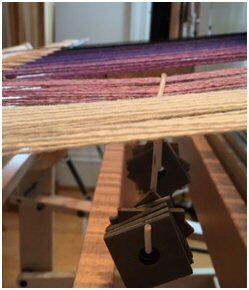 Knowing helps make weaving deliberate to achieve the result you are hoping for. Weave with intention. It does help the results. · * Relax your shoulders. It helps you with your rhythm, Loom Music as Laura calls it. Your accuracy will follow. Eventually the speed does too. · * Don’t use extra motions. I thought I was holding the shuttle above the beater each time but had the time to realize I was lifting it as I was supposed to but pulling it back towards me. The shuttle wasn’t waiting in the perfect place to hit the race and make the next pick. I was using energy I could use to keep weaving. Be aware where your hands are. You can weave longer and with more accuracy. · *Advance the warp regularly. There is a small sweet spot. You will get better results-straighter selvedges and a more evenly beat web if you advance every inch and a half or two inches (on my Baby Mac) making the entire process more rewarding. · *About this time I was breaking a sweat. This weaving is work! Make sure to tighten your core and make a slight rocking motion back to beat, forwards when changing the shed. When this motion comes from your core it reduces wear and tear on your upper body. You can weave longer. I mean that both that day and as a lifetime activity. · * There is a rhythm that will improve your selvedges and your cloth. Throw the shuttle, beat before/as the shed closes, change shed and repeat. The yarn is free to settle into the length it needs for a repeatable length of yarn in the pick. When I would throw, close the shed “locking in” the length of the yarn and then beat, the length of the yarn changed depending on how close the fell line was to the beater and the exact angle of the thread to the fell line. My selvedges straightened right out. My friend Kaaren said it doesn’t always hold true and I plan on having a chit chat with her about that. She’s a wonderful and knowledgeable weaver too. · * Distinguish between operator error and loom error. Sometimes it’s you, sometimes it’s not. · Relax your shoulders. Have I said how important I think this is yet? It’s easier to weave when your shoulders aren’t all balled up. Easier to sleep that night too. · Sometimes you have to ask for help. Laura isn’t a helicopter instructor which was good for me. I could announce every once in a while what I had just learned so she could get a giggle. When I needed help though, I needed an explanation why things were going wrong. · * Last but not least, sometimes you just have to walk away Renae. Come back another day. Sleeping seems to help your body remember the lessons learned that day so things fall into place easier the next day. All this made me realize just what a process it is learning to be an Efficient Weaver. 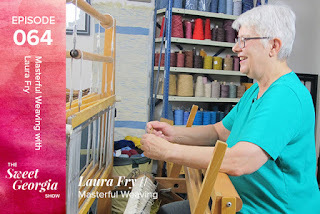 Yes, I’ve taken her class and I have her wonderful Video The Efficient Weaver Thanks to both of those I had an idea what I wanted to pay attention to and where I was heading. If you have a chance, both are wonderful learning experiences and she didn’t pay me to say that. Lest you think I did nothing but weave, I learned these things and with a couple of them my body learned them too with a two hour session one day and an hour and forty minutes the next. I was weaving with every sense open and attentive. No daydreaming happened. Each movement was felt and thought about. When I weave with intent at home these lessons have and are becoming part of my weaving practice. What about the rest of the week? Why, I learned the basic stitches of bobbin lace. The second day it also started to become body memory. I reveled in the snow and left snow angels around the neighborhood. I spent an evening with my Prince George guild and enjoyed women whose company I love and who return the love. I watched Laura enjoy her new e-spinner, The Device, while I spun on my Russian spindle. We drank a lot of tea and laughed a lot. Everywhere I looked there was an inspiring bit of hand woven to make my heart sing. I’ll be back in three months. Who knows what I’ll learn then! I can’t wait. One of the really big benefits of shopping at a fibre festival like Fibres West (or Olds Fibre Week or even the ANWG or other regional conference) is that you find out what else suppliers have in stock. This year Jane Stafford had some new things which weavers might find useful. I have been a big fan of Color Catchers for years, but it's almost impossible to find them in Canada. However, Jane is now stocking Dr. Beckmann's Colour and Dirt Collectors which essentially do the same thing - trap loose dye and prevent it from settling elsewhere. I routinely use these whenever I am weaving with hand dyed yarn, especially cellulose (rayon, bamboo, cotton, linen) yarns. As always, I recommend that such yarns do NOT soak, at all, ever, even with these colour catchers. Rather I recommend rinsing, rinsing, rinsing until the water is clear, or at least just a 'blush' of colour left, to prevent migration of loose dye. The little magnifying glass is helpful if you want to see the weave structure of a cloth up close. Check out http://janestaffordtextiles.com or email if these items are not yet on her website. Had a chance to talk to several of our presenters for Confluences next year. One of the reasons I enjoy Fibre festivals is the opportunity for face to face interactions with other Fibre people. Our theme celebrates the fact that every culture around the world has some intimate involvement with textiles and one way to bridge cultures is to find a point of commonality. If we can find that common ground, we can find respect and communicate beyond cultural differences. While down here we went to the Museum of Anthropology to see the Salish textile exhibit. It was a powerful display of craftsmanship. It had both traditional and contemporary textiles. It was so good to see that the knowledge and skills are being preserved and shared with the public. One of our presenters was involved in some of the work in bringing this exhibit to the museum and we are greatful for her work. Watch for details of her presentation on the conference blog/website. Confluences. The coming together of people, ideas, skills, cultures, all within the field of textiles. It has been heart warming to have both level one classes sending in their homework. At this rate, I think everyone will complete their homework and get it to me. And if not, well sometimes Life Happens and we can't always do what we want to do. A discussion on a group I belong to was talking about 'perfection' and how if we aren't perfect we have - somehow - failed. It is a concept I understand all too well. When I was a kid in school, unless I brought home all A's, the focus was on what *wasn't* an A and a lecture on how I needed to do better. Because a B simply wasn't 'good enough'. I was expected to at least be in the top 10 in the class. Woe betide me if I wasn't. Working with textiles all my adult life I very quickly had to get comfortable with never being 'perfect'. Figuring out that good was good enough. That didn't mean I didn't try, try, try to do better. To be better. But, as a teacher, what is my job? To rubber stamp whatever my students do? To only point out their 'flaws'? I try to be more balanced than that. I try to encourage. I try to gently point out where more attention needs to be paid by the weaver while recognizing what is 'good enough'. And some of the work truly is so close to perfect that there is little I can say. In my role as teacher I try to bring my decades of experience as a production weaver to share with the students. I recently had someone comment - again - on how fast I was. Yes. I am. I've spent my life becoming as efficient as I am. Do I expect every student to emulate me? No. I expect them to become the best they can be. And always strive to be better. But I don't expect them to be me. I see my main job teaching the Olds master weaving level ones as helping students understand the principles. Of encouraging them to question. To wonder why. To ask 'what if'. To set them up for the following levels. Yesterday I was thinking about all the things I've written, including this blog. 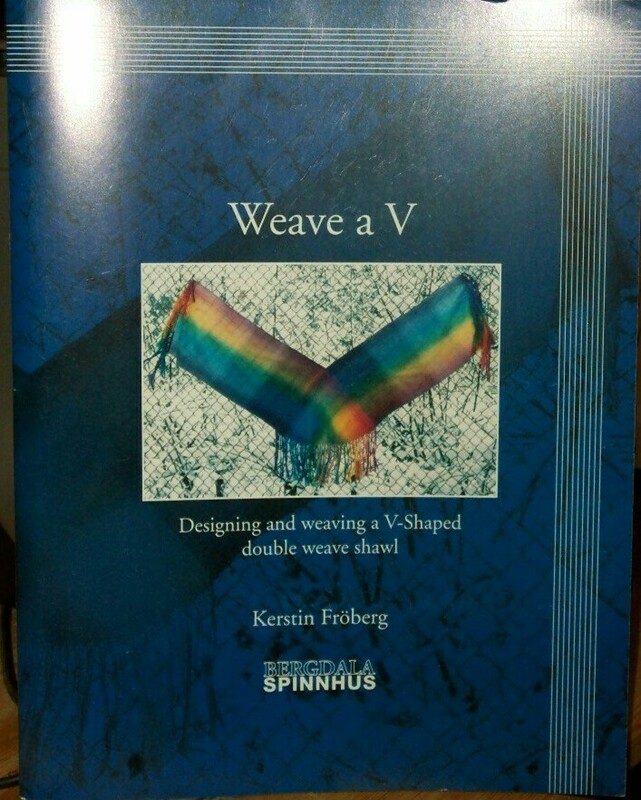 But I also published Weave a V*, Kerstin's book (in English). I have also been thinking about the conference planning, which I really need to get back to - SOON! - and plans to have an author signing event at the conference. I intend to have The Intentional Weaver ready for sale by the end of this year and will likely purchase some actual print copies to sell in my vendor booth at the conference. No, I won't be teaching, although it is likely I'll be part of seminar on the Olds programs, spinning and weaving. In the end I decided to not even attempt to teach at the conference. 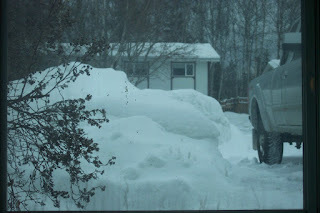 It seemed like the straw that might break the camel's back to teach (maybe) level three at Cape Breton, come home to oversee (along with my right and left hand women) the conference, make sure the instructors have what they need, etc., then drive to Olds to (maybe) teach level one there again. My roller coaster of a schedule will be quite busy enough without my teaching at the conference as well. But I have nearly completed the special commission for a new publication (actually two) that is in production. I just have to get final measurements, re-read my project notes, append my bio and package it all up to ship on Monday. Yesterday I laid out my schedule for the next six months and took a big gulp. It's going to be busy! The yarn arrived yesterday afternoon. I immediately opened the box and checked my initial calculations once I had the actual yarn in hand, and everything seemed ok. I wound the warp and started filling out the project notes. By the time I'd done that it was dinner time, so I left it until this afternoon. Last night I could not get to sleep. As I tossed and turned the thought squirrels started flailing. Was the epi I chose really good for this slippery silk yarn? Should I increase it? That would mean redoing the draft to accommodate the narrower width. Did I have enough yarn to wind more ends? Eventually I fell asleep but had to be up early. After lunch I re-did the math. Eyeballed the cones. Yes, it looked like enough for 40 ends. As I wound the warp I realized I probably only needed 36 ends. So, back up to the computer, adjusting the draft. Yes, 36 ends it was. Back down to the studio to finish the small chain, which then got added to the lease sticks so I could rough sley both chains and get them beamed at the same time. There might have been enough for 40 ends, but it would have been squeaky close. And a reminder that sometimes you really need to pay attention to the thought squirrels, as annoying as they may be at 2 am...and thank goodness for always adding in a bit of a fudge factor. 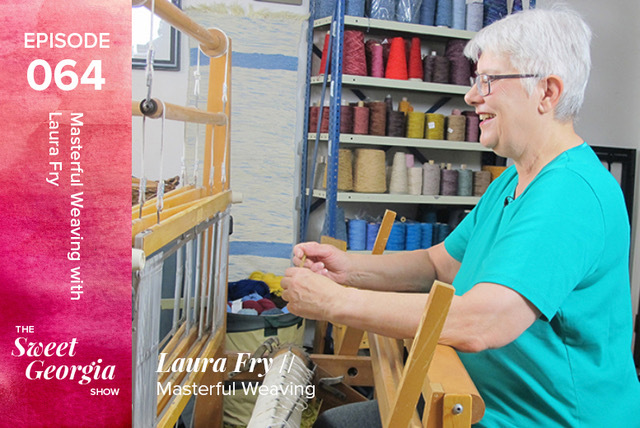 The photo is from the photo shoot Interweave did for The Efficient Weaver. One of the reasons I particularly wanted to do this DVD (now downloadable course) was to show proper position and posture at the loom. I so often see photos on the internet of people sitting at the loom in a chair or on a bench that is too low for proper ergonomics. I wince. Because while it may not hurt today or even next week, over time sitting 'poorly' will hurt. Most looms are tall enough that an ordinary chair is simply too low. Ordinary chairs are also generally raked to the back, putting your hips and knees into a 'bad' position relative to each other. If you only have an ordinary chair, build it up with cushions. What to look for? Elbows should be higher than the breast beam. Hips higher than knees. Sit forward so that you are perched on the edge of the bench, on your sitz bones. Sit up straight. Pivot from your hips. Engage your core muscles. Shoulders in neutral. Throw the shuttle with thumb up, not down. 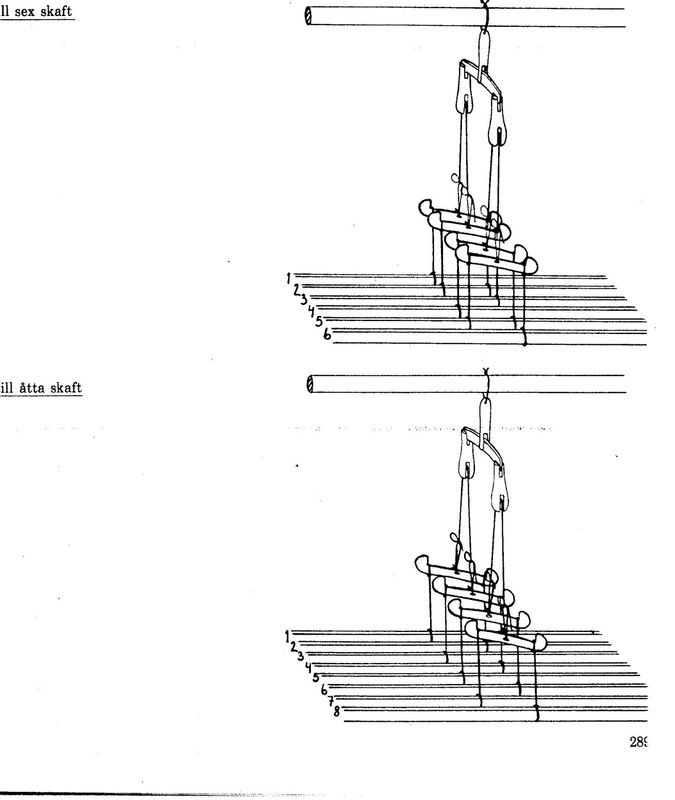 Recently Beth Smith did a blog post where she talks about changing her shuttle handling. Be kind to your body. Work ergonomically. This year my high school graduating class is having a 50th year reunion. I was never in the 'in' crowd at school. I suppose I might have been considered a bit of a nerd. I actually liked school - for the most part. I enjoyed reading. I did my homework. Usually at the last minute because I've always worked best to deadline. The other day I talked to some people in my graduating class and when asked if I would be attending the reunion I said that I might be out of town. And was met with a rather disparaging, negative comment. I turned to the person and told him that it would depend because I might be out of town. "Because I am still working after all". As a self-employed person for the past 40 mumble years, I have not accrued wealth - or at least not in terms of money - nor a comfortable pension plan. I get whatever the federal government gives anybody in Canada. But it's every month, and I have a level of financial security I have not had for too many years to count. I turn 68 this year. Many of my peers have been 'retired' for several years. But why should I retire from something I love to do? So long as I am physically able, I see no reason to 'retire'. The past 10 years have been...difficult. My health has suffered. I have just come off a year plus episode of cancer related fatigue. I find it more and more difficult to get up and get going like I used to be able to do. I run out of steam. Is this what aging is? Is this what getting 'old' is? Is this why people 'retire'? That they just get...tired? The craft fair circuit is physically demanding. The market for hand made goods is changing. Faith Popcorn predicted it way back in the 1990's - that people are saturated with 'things' and that as the baby boomers aged, they would not be buying material goods but small, consumable luxuries. Vendors at craft fairs are increasingly selling food or other consumables - like personal care products. They have enough place mats. Enough scarves. Enough pottery. Art for their walls. They buy chocolate. Spices. Pre-mixed soup makings. Soap. This year I will do two craft fairs here in Prince George and instead of Vancouver, I've applied to do the large show in Calgary, Art Market. I took a sabbatical from that show for two years and feel it might be time to try it again. Plus I would have a week between the 2nd show here and going to Calgary, to rest after two back to back shows. Because I don't have the energy I had. I need to be sensible about my health. And I need to think about where I want to spend what energy I do have. So I am not looking at teaching for guilds much anymore. I am putting my energy into other venues. On line teaching - perhaps - if it works out (and why I may be out of town in August.) The Olds program. 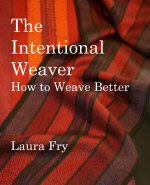 Finishing The Intentional Weaver. But the new year is well established and the calendar keeps rolling, day by day. Deadlines come - and go. And I am finally starting to feel better without the crushing fatigue and brain fog that I had been dealing with for the past year or so. While I am not yet back to something I would even consider 'normal', I can think again. For example, one of the critical deadlines creeping up closer, closer, is being dealt with as everyone involved does a mad scramble to get me the yarns in time to weave the scarves. I was able to get the yarn information, crunch the numbers and get the information back to the supplier within the hour so that they can wind skeins onto cones and get it into their regular shipping by 2 pm their time. Hopefully the courier will co-operate and get it to me by the weekend so I can toss everything else aside as soon as it arrives and I can slam the warp onto the AVL and get them woven, wet finished and back into the mail/courier before we leave for Vancouver on the 21st. This week I don't have as many appointments so my priority will be to get the Olds homework marked and the information back to the students. And carry on weaving a scarf a day on the small loom - until the deadline yarn arrives. After that? More place mats. I thought I'd woven plenty, but when seen set out on the shelves? Nope. Plus tea towel warps. Doug has convinced me to do some table runners, too. And then...there's the manuscript. I have a half hour or so today where I could have chosen to read while I waited for my friend at her appointment or...work on the ms. So I have packed the binder along with scrap paper so I can start planning the projects. The warp is mostly a medium value kind of tomato red (a little more intense than the photo shows), with some yellow. The first weft is a very light value yellow, the second weft a medium darker tomato red. The lighter value yellow washes the red out, turning the scarf into a mostly yellow with a little red. The red weft intensifies the red and makes the yellow 'pop'. Value is more important than hue when choosing weft colours to show off the warp. The next scarf I'm going to try a green about the same value as the red. I may - or may not - actually weave a scarf with the green. But! Value is more important than hue!!! Generalizations are great. They help in remembering nuggets of information. Unfortunately, when propogating a generalization it is a good idea to remember that there are, inevitably, exceptions to the rule. I have been guilty of pushing generalizations. The most common one is 'it isn't finished until it's wet finished'. But there are exceptions to that 'rule', too. Example? If an art piece has been woven with plant materials, perhaps. If the textile in question is never in its life going to be washed, perhaps. So when you hear these sorts of generalizations, remember to keep in mind that there may well be exceptions. There are a couple of generalizations about counter balanced looms that I see repeated over and over again without the qualifier that there are exceptions. One is that of counter balanced looms being unable to weave unbalanced weaves. That statement is sort of true for roller type looms. The shed is, indeed, compromised. But I have one of those roller type looms and I have woven unbalanced weaves on it. Yes, the shed is compromised. I may have to weave with looser tension. I usually switch to a low profile shuttle. And I take greater care in my shuttle handling. However, on a loom with horses (levers) instead of rollers, typical of Scandinavian type looms, unbalanced weaves are woven all the time with no difficulty at all. The other generalization about counter balanced looms is that they can only have four shafts. While this may (or may not) be true of roller type counter balanced looms, it is wrong for Scandinavian style looms with horses. The 10 shafts for satin means a block of 1/4 and a block of 4/1 satin being woven. Both of these are unbalanced. It is also a common weave structure where these looms are common. So, when you hear a generalization, think about the exceptions. Yes, I have a piece of paper that says I am a 'master weaver'. No, I am not perfect. Some days I struggle. With concentration. With focus. With brain fog/fatigue. With co-ordination. This one little 'flaw'? Proof that I am human. I make mistakes. I struggle, physically, mentally, emotionally. Just like every other human being. 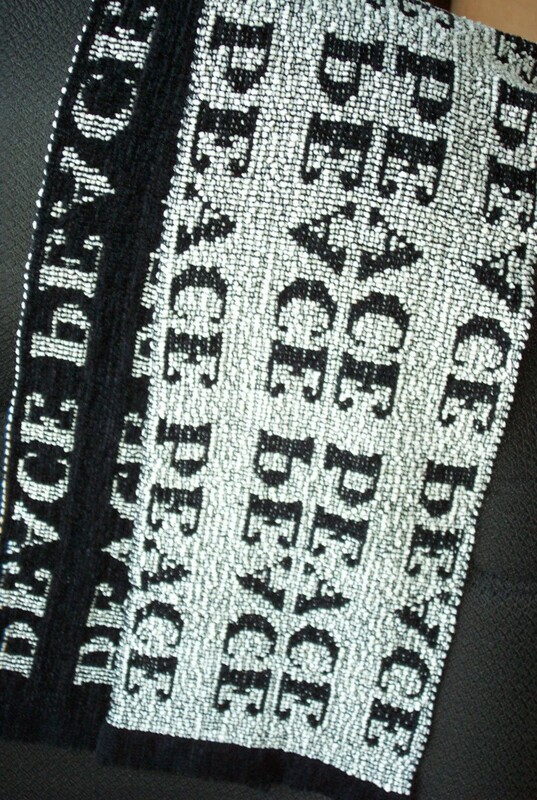 Am I going to beat myself up because this scarf has this one tiny 'flaw'? No. Absolutely not. The world will beat on me quite enough, thankyouverymuch. I don't need to do it to myself. Especially over something that most people will not notice, and - even if they do - won't care about. Mastering a craft does not mean that you no longer make mistakes. It does not mean that you are 'perfect'. What it means is that you have a basic understanding of the craft. You know how your tools work, and which ones are appropriate in the circumstances. It means you understand the craft well beyond a superficial level. And that you understand that there will be no end to the number of layers you can peel off and still learn something new. I have lived in Canada all my life. But I'm white. My experience does not reflect the experience of recent immigrants, or - especially - the people who were here before the Europeans came. If you are white, please take the time to understand life from the point of view of others. White is not the 'default' of most of the world. It's time white folk understood that. For Canadians, take the time to watch some of the programs on the APTN network. Start with 1491; North America before Columbus. Watch Wild Archeology. Go to the NFB website and watch some of the documentaries there on the aboriginal point of view and/or experience. If you are from central BC (or anywhere, really), read books like Stoney Creek Woman by Bridget Moran. Or The Right to be Cold by Sheila Watt-Cloutier. In my weaving life, I learn something from every warp. Sometimes the lessons are based in exploring different structures, techniques or yarns; other times they come from air-brained moments of inattention. My latest adventure was a puzzle that required thought and analysis. 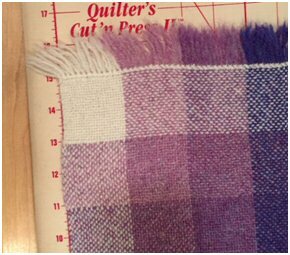 As a student in the Olds Master Weaver program, Level 1, one of my assignments was weaving a value gamp composed of six colours of woollen-spun wool. The goal was to complete a twelve-inch grid with each cell measuring two inches after finishing. Using information from previous work with my chosen yarn, I forged ahead and produced a sample with five colours behaving predictably and one very long stripe that was not conforming in either warp or weft directions. As my frustration grew, I recalled that, when winding the warp, the colours had not felt the same when running through my fingers. Some had felt smooth and fine while others gave the impression of being rougher and bulkier. It was time to examine the yarns in more detail. First, I checked the staple length of the fibres, pulling apart the strands and extracting small quantities of wool. 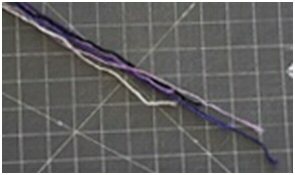 I found that the longest staple lengths varied between 1" and 1 3/4" depending on the colour. These results were repeatable over three samples. Next, I looked at the fibres under a magnifying glass and noticed differences in the diameters of the fibres as well as the degrees of crimp. The longer samples were greater in diameter with less crimp. Since we know that these differences can translate into variations in fulling properties, I hoped I was starting to decipher the puzzle. As a final check, I measured each colour on a McMorran yarn balance, so that in theory I had the same weight of each yarn - 1/3,600th of a pound. My theory was that if these yarns had all been spun to the same yards per pound, the resulting strands should have been the same length - or close - given my basic measuring technique and acceptable variation between processing batches in the factory. The results revealed significant differences between sample lengths of different colours both before and after washing. The measurement techniques used in these experiments are crude; nonetheless, they do provide an overview of what is happening with these yarns. The results were enough to convince me that when the fleeces were selected and blended in the mill prior to spinning, there had been definite differences in the characteristics of the wool used. As a final test, I purchased another cone of the problem colour from a different dye lot. It worked! The next sample finished with straight hemstitching and no wonky selvedge. Lessons learned included the need to trust my own perceptions of a yarn, strategies for checking yarn collections for similar properties, and the importance of sample, sample, sample!